Francis S. Staley was the manager of the company, which was located in Yellow Springs, Maryland, an unincorporated area northwest of Frederick. The card likely dates from sometime between 1935 and 1970, based upon the "Frederick 1838" phone number and some other information that I've detailed below. In trying to find out more about this company and Francis S. Staley, I ran into numerous dead ends. I was just about to give up and file this one under "Mysteries". I don't have a membership to Ancestry.com, but even non-members are able to use the site's search function to get limited results from its immense newspaper archives. Two of the newspapers in Ancestry.com's archives are The Frederick Post (formerly the morning paper) and The News (formerly the evening paper)1. Using incomplete "blurbs" primarily from those two newspapers, I am able to tell some of the story of the Staley family and Ideal Concrete Stone Co.
1908 (approximate): Francis S. Staley is born to Milton E. Staley and Virgie M. Staley. 1908: Milton E. Staley places a classified advertisement in a Frederick newspaper seeking an "experienced man to sell vehicles through Maryland." 1911: Milton E. Staley runs multiple classified advertisements selling "choice potatoes" from his Yellow Springs home. 1911: Milton E. Staley is listed as a "Railway Station Agent" in Yellow Springs. 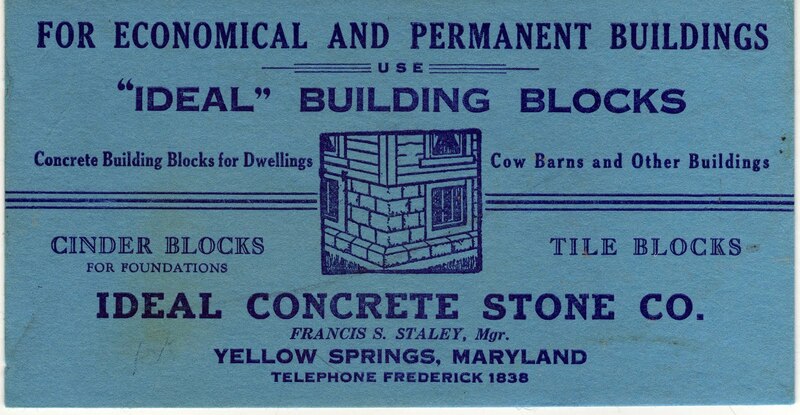 1923 (October): This classified advertisement appears in a Frederick newspaper: "FOR SALE - CONCRETE BUILDING block. Fireproof and waterproof. Size 8x8x16. If you are building a home, garage or foundation get our prices. Phone 1838-F-18. 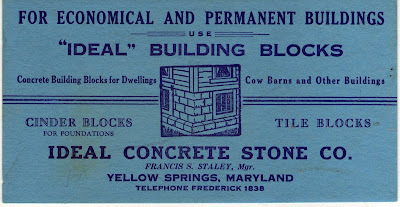 Milton E. Staley, Ideal Concrete Stone Co., Yellow Springs, Md." 1925 (February): M.E. Staley and C.H. Kehne appear to be listed as the co-proprietors of Ideal Concrete Stone Co.
1928 (December): The Frederick Post reports: "The business of the Ideal Concrete Stone Company plant, Yellow Springs, Md., phone 1838-F-13, formerly operated by Milton E. Staley (deceased) is now being handled by Mrs. Milton E. Staley; George R. Summers, superintendent..."
1936 (April): "Mrs. Virgie M. Staley, who has been at her home at Yellow Springs, is now able to be about her room. Her son, Francis S. Staley, who sustained a severe fall several days ago, is confined to his bed." 1936 (December): Francis S. Staley, in place of his deceased father, gives his sister away at her wedding. 1968 (December): "Mrs. Virgie M. Staley, widow of Milton E. Staley, died at the Home for the Aged, 115 Record Street, Frederick..."
So, that's what I could find about the Staleys. And none of this would have resurfaced and been researched if someone hadn't decided to tuck their blue advertising card for Ideal Concrete Stone Co. between the pages of their book a half-century or more ago. 1. Those two newspapers were merged in 2002 to create a single daily newspaper, the Frederick News-Post. 2. That is all I was able to see in the "blurb" on Ancestry.com. I would need a subscription to the site to read the full account of Staley's sad fate. 3. Burkittsville is less than 20 miles west of the Frederick area, so it's certainly possible that Staley was living in Burkittsville and still operating the concrete business in Yellow Springs at this time. 4. Mount Airy is about 16 miles east of Frederick.